Successfully Added Seeeduino Google Android Open ADK Main Board (Arduino Mega 2560 + USB Host) to your Shopping Cart. Introducing the next big thing in tech-world: Android Arduino open accessory development kits. Do you have a great idea for an Android accessory? Then this Seeeduino Android ADK main board is the go-to choice for DIY’ers everywhere. Using the Seeeduino, you’ll be prototyping your custom designed product in mere hours. Just search online for “Arduino tutorials” and you’ll find limitless resources teaching you how to program things like robots, washing machine controllers, automated desk lamps, fish feeders and even 3D printers. Whatever gadget you want to build, it’s possible using the Arduino ADK board! 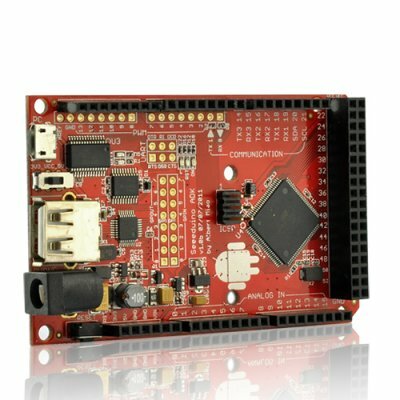 What is the Android Open Accessory Development Kit? The Android 3.1 platform (also backported to Android 2.3.4) introduces Android Open Accessory support, which allows external USB hardware (an Android USB accessory) to interact with an Android-powered device in a special "accessory" mode. When an Android-powered device is in accessory mode, the connected accessory acts as the USB host (powers the bus and enumerates devices) and the Android-powered device acts as the device. On top of that, Mega2560 is the latest release of the Arduino Mega series and includes an upgraded chip set with 256k flash memory (double the original mega board's memory). Additionally, you get more programming space and more complex functionality. The thing is a beast with 54 digital input/output pins (14 of those offering PWM), 16 analog inputs, 4 Serial UARTs, and a built-in USB host shield. The sky is truly the limit for what can be done with this board. This Seeduino Google Android Open ADK Main Board is available in our warehouse now. Order yours today and we'll ship it out tomorrow. Brought to you by your source for cool high tech gadgets, Chinavasion. PLEASE NOTE: Please make sure you fully understand what this product does, as we DO NOT provide assistance with its usage or setup, nor do we include any warranty. A user manual is also NOT provided, however, there are plenty of online resources available. 5v/3v3 IO Level selectable (Atmega2560 running on 16MHz@3.3v is a bit over-clock, but according to the test result, works fine). Please make sure you fully understand what this product does, as we CANNOT assist with its usage. A user manual is also NOT provided, however, there are plenty of online resources available.